If any of you are going in to Annexed withdrawals (Joe), never fear! Annexed will be making regular appearances within The OCp. “But I thought you weren’t working down at The Mall anymore Sarah?” Well, I’m not. But Barry and Bubbles are (at least a couple of days a week) and they act as my eyes and ears on the ground, providing me updates and snapshots. First of all, the ongoing saga of the ceiling leaks at The Mall continues. 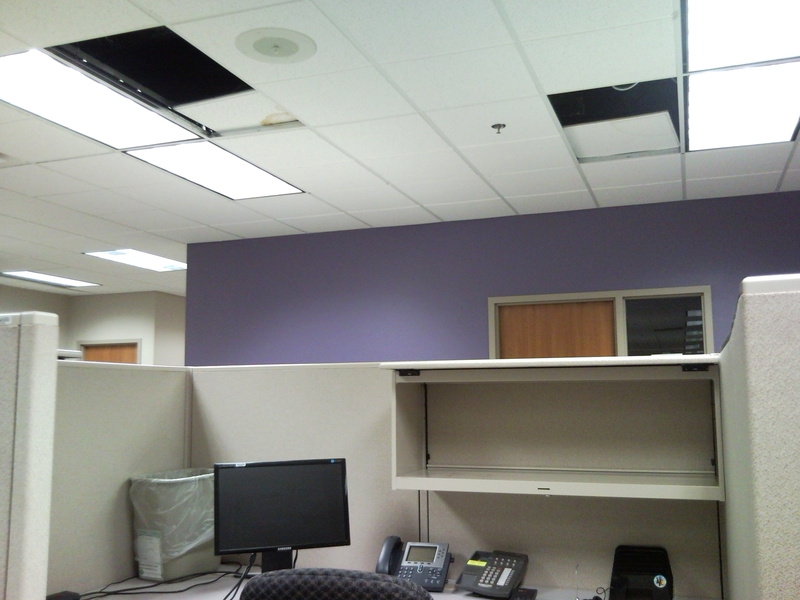 If you’re tracking, it’s been 2 weeks now that the ceiling has leaked and still not been fixed. And the same garbage cans are still there catching the drips. Ew. But there was a bit of progress – 3 facilities guys were spotted staring up in to the caverns of the ceiling. They didn’t do anything about it but at least they made an appearance. 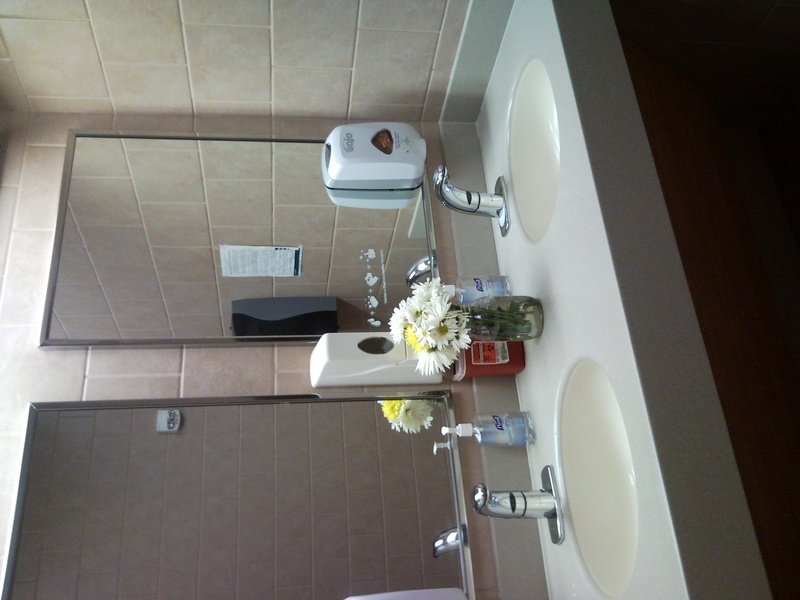 Also, remember the flowers that were put in our bathrooms here at OCP last week? Well The Mall decided to emulate us and do the same thing. Bubbles found flowers there on Monday morning. That bathroom needs more than a bouquet of flowers to help it along, but every little bit helps I guess! So I haven’t talked much about the mall itself in a while. Scooter has kept a low profile and we haven’t made a visit to John’s lately. But there was a little bit of action this week. We had a Zamboni sighting. Yes, that’s right, a Zamboni. Well, sort of. Apparently there was a guy out there buffing up the floors (wonder if that’s where my quarter disappeared to). Bubbles: Some Annexed tidbits – I was out in the mall an hour ago and there was a guy polishing/cleaning/buffing the floors with one of those huge polishers/cleaners/buffers – the one that looks like a Zamboni. Me: I find it interesting that we’ve been down there for 4 months and we’re just now spotting this Zamboni thing. Is it any relation to Big Foot? Any pics? Bubbles: Damn – I didn’t get a pic! I blew it!! Me: No worries, not everyone can be as good as me. Bubbles: True, you’re the master and I only hope to one day be as good as you at taking random subtle pictures around the office. Anyway, the Zamboni dude was a young kid and he had on big baggy black pants and a black sweatshirt. He may or may not have worn headphones. I was waiting for some kind of baggy pant/Zamboni incident. Me: Oh yeah, that would not have been good. Thank you Bubbles for that report! I literally almost peed my pants I was laughing so hard. Just wanted to let you know that the equipment you are using (monitor and docking station) is going to be pulled tonight or tomorrow morning by site support from the desk you are using today…If you need space at OCP, please let me know and I will be happy to reserve something for you. All the empty desks on 3rd floor have now been spoken for and are assigned to owners or will be used soon. Please reserve space ahead of time if you want to work from this location for the day. Then, about 3 hours later, one of the Directors stopped by and told him he was “wreaking havoc” by sitting in that desk. Barry thought that perhaps today he’d just work from the dumpster outside but I told him he could only do that if he reserved it first. Speaking of desks, I found some suspicious activity when I saw mine this morning . 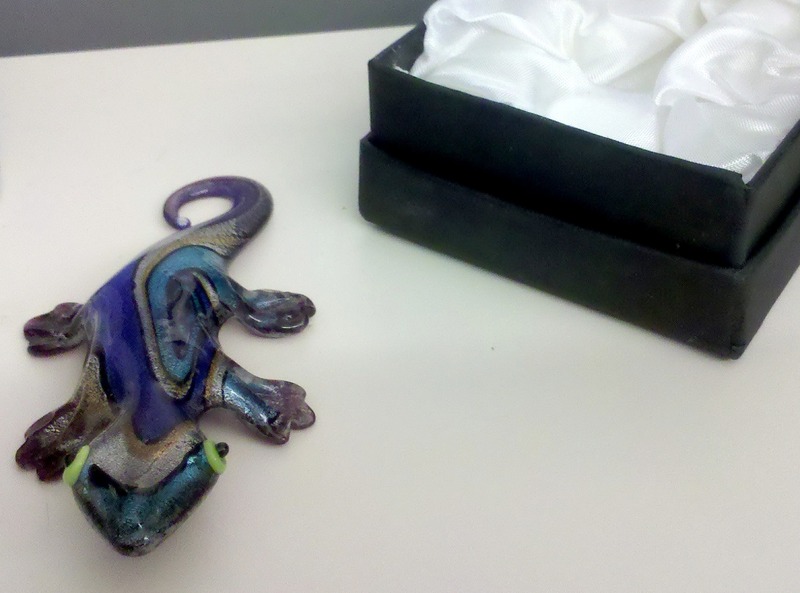 I walked in to find my stuff all askew – my keyboard was pushed back and kind of set topsy-turvy on my laptop, a poster on my wall was crooked, my phone was turned and my pretty little Gabby Gekko was removed from her bed. My first thought was that Bob was messing with me. But then one by one, as more people arrived, we discovered their stuff had been jacked with too. One guy had a card on his shelf turned around. Someone else had napkins tossed across her desk and over the keyboard. Bob claims to have nothing to do with it so who is responsible? Best guess? All our stuff had come alive over night (not unlike “Night at the Museum”) and wasn’t able to get back to starting position before the lights came on this morning. Or else it was the overnight cleaning crew. Apparently they get mad when you don’t leave your desk and surrounding area spick-and-span and feel they have the right to move your stuff around. Hey, I get it, they don’t have the most glamorous job. And I know they probably get frustrated when we leave popcorn kernels on the floor or track mud in from outside. But you know what? It’s part of their job to clean the office. It’s not like we do it on purpose. “Hey guys – let’s leave a big pile of poo over here on the floor just to tick them off!” We try to leave our area as neat as possible but crumbs get spilled and dirt gets tracked in. That doesn’t give you the right to riffle through our belongings and throw it around. Now put fresh flowers in the bathroom and leave my stuff alone! Thanks for tuning in and be sure to come back next week for more from The OCp!